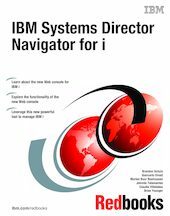 In this IBM® Redbooks® publication we discuss IBM Systems Director Navigator for i, which is a Web console interface for IBM i administration where you can work with the Web-enabled tasks of System i® Navigator. IBM Systems Director Navigator for i includes a number of welcome pages that allow you to quickly find the task that you want to perform. The IBM Systems Director Navigator for i interface is not just a set of URL addressable tasks, but is a robust Web console from which you can manage your IBM i system. However, the System i Navigator Tasks on the Web, which are a set of URL-addressable tasks, can be accessed by using the URL or from within the IBM Systems Director Navigator for i interface. The information in this book is intended to help you start using the Web-based console, IBM Systems Director Navigator for i, by providing you with a look at the new interface as well as tips for working with various parts of the new console.